Pick list (or Product Catalog) is the place where all your products are kept for future use. Once you add an item to a shopping list, it automatically goes to the Pick list. 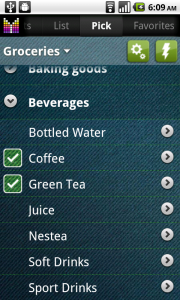 To change current shopping list use shopping list selector on the top of the screen. It is also possible to add items from Pick list to Favorites by choosing Favorites in the shopping list selector. Once products are available in your Product Catalog, they can be added to the selected shopping list directly from Pick list screen by tapping a record or by using Plus button on top of the shopping list screen. 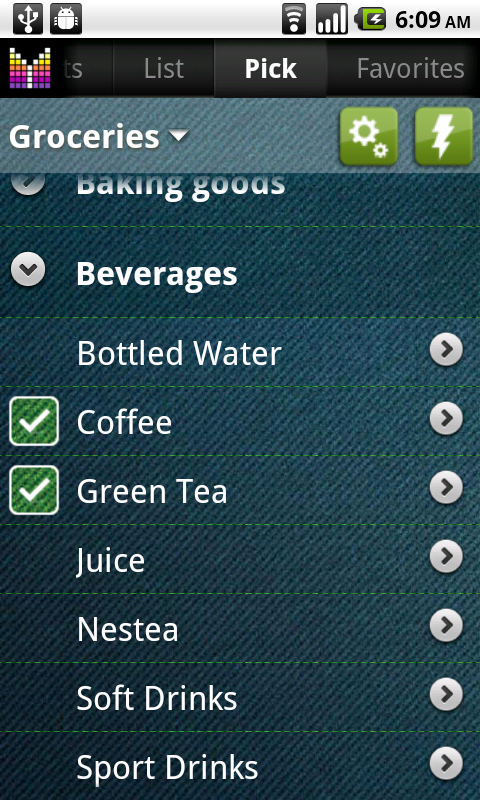 Mighty Grocery app comes with predefined catalog which can be customized to your needs. To customize Pick list, please see Configure Pick list User’s Guide. If you’d like to configure your Product Catalog, go to Menu > Settings > Pick list or tap Gears button on top of the Pick list screen. Aisles in Pick list are sorted according to Aisle configuration of the current shopping list. It can be changed under Gears button > Aisles. Pick list tab only contains visible products. Also, when you press Plus button in a shopping list, the app shows you visible products from the Pick list. Product is visible if “Show in Search and Pick list” option set to ON for both this product and its aisle to which it belongs. However, Configure Pick list tab will contain all items, including invisible. Invisible items will be striked out in Pick Settings tab. If you don’t want items to be added to you Product Catalog automatically, set Menu > Settings > Options > Advanced > Automatic picks option to OFF. I’m sure this had been answered elsewhere but how do I see *only* those items that have the ‘Show in Pick list and Search’ box un-checked (so that I can check it)? I have thousands of items in my pick list at this point so it’s time consuming to scroll through all of them trying to spot ones that have a strike out. I love this app. I’ve tried multiple ones and also come back to this one. The thing I would love to be added is the ability to see how much an item costs without the tax so I know if I should change it to a new cost or not. Currently it shows the item and the tax included price to the right. I’ve been putting the “shelf price” in the comment section but that requires me to change the price in two spots to keep my list updated and when your shopping with two small children faster is better. I love knowing what my final cost will be which is shown at the bottom but was hoping for a setting that allows my unit cost to show up without tax but my checkout total to still be with tax included. Thanks a lot for your time. I love this app and have been using it for a while now so I thank you for all the time & work you put into it. I have been using the app for one specific detailed list that I use every week but now am expanding my use to include a superlist and several sublist. #1: Please tell me if the pick list is one single list of every product I enter from every shopping list I have OR is it several pick lists based for each shopping list I have? #2: If the pick list is multiple lists, can I move items from one pick list to another, if so how? Yvette, Pick list is one list of all products used in your app. If you’d like separate product selections per list, you may want to consider List-specific Favorites. I am trying to add my phone picklist to my Tablet for easier editing and adding. But my pushing does not seem to push the aisles correctly. When I get on the Tablet there is no Pull pick list from Cloud. I hope I don’t have to recreate the whole pick list! Leslie, thanks for your feedback. Unfortunately, Mighty Grocery does not allow syncing Pick list instantly. This is planned for the next update. In the meantime, you can create Backup on your primary phone and restore backup on your tablet to transfer all grocery data. For more details please see Backup on Cloud User’s Guide for more details. I’m using MG now for one week. Really a great app. I buy mainly in two stores and therefore I made two shopping lists. Now I want to add items from my inventory list into the specific shopping list. F.ex. bread to shopping list 1 and milk to shopping list 2. How can I do that. I tried it over the favorites, but without success. It would be nice, if there is a button in the items-menue where I can define the shopping list. It would be great, after buying items to refill the stock, to scan this items and MG automatically increases the quantity in the inventory list. Heinz, thanks a lot for your feedback. If you’d like to place item from Pantry to different lists, you can tap a pantry item in the middle (not checkbox) > Copy to > select lists that you’d like your item in. You may want to try using list-specific favorites if item prices are different between stores. We will consider adding more features to scanning barcodes in Pantry. As of now, the app will locate the pantry item when scanned and you could switch to Edit mode to adjust quantity as you like using +/- buttons. Thanks for your answer. The copying the item to the specific list requires two tapps. It will be more comfortable to have an entry for every item where to buy it and it will be copied to the specific list by tabbing the checkbox on the left. Heinz, thanks for your response. We have plans on introducing such feature going forward.